As a kid I was obsessed with dolphins and whales. 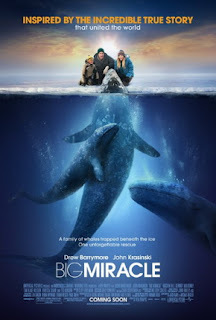 So I was excited to see A Dolphin's Tale and Big Miracle. I saw the preview for it when I went to see War Horse and I was stoked because it also had Jim (from The Office) in it! Unfortunately, it came and went from theatres in the time it takes to read the title. I guess it was a flop or something. It's not a creative or cinematic masterpiece or anything, but I think it's about the same caliber as any other kids' movie about loving or saving animals. The story is about three grey whales trapped by frozen ice in Alaska. They didn't make their migration before the ice progressed and now they're stuck and can't make it to the ocean. Greenpeace gets involved and other government workers, the national guard, oil companies--it's a real collage of people fighting to free the whales. The best part is that it's based on actual events and the end credits show footage and photos of the real people. It's a good family-friendly movie, but as I said, don't expect much more than your basic animal-centric kid movie.